2 minute weekly puzzle. The Point Puzzle includes word puzzles and logic puzzles. Solvers email their answers to puzzle@kpov.org. Each week the winner (and station) from the last week is announced and a new puzzle is posed for the coming week. 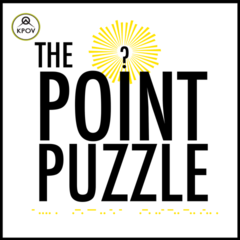 The Point Puzzle is a 2 minute weekly puzzle. Each week a new logic or word puzzle is posed and the answer is given for the previous week. Listeners can submit answers by email and a randomly selected winner is announced each week along with the station call letters where they are from. The puzzle has been produced at KPOV since May of 2013. The puzzle is uploaded on Tuesdays and is intended to be used Wednesday through Friday weekly.